Clare Crowther is proud to have played a small part in the massive roll out of a new education programme across Toastmasters International. Her part in the implementation programme was to present eight live training sessions and run 15 initial virtual support sessions – webinars and Q&A sessions. The webinars will continue for the next few months. Another “string to the bow”! Seven visits in 11 days - an exhausting and worthwhile road trip delivering Pathways Roll Out training from Hull to Warrington, and many places in between. Clare's "Change ... and You" professional development session received a great reception from a mixed audience of insurance brokers and financial advisers. Instead of the usual emphasis of how to "manage" change, this session concentrated on how to receive change. Several audience members commented on how it helped them with their non-work changes as well as in the world of work. Clare Crowther's new speech, "My Life as An Actress Dahling ... an Extra Perspective!" was well received by a local community group. This illustrated talk not only plots the path from an 11 year old to the present day, but also gives a "behind the scenes" view of working on feature films and TV productions. The Rotary Club of Humberside welcomes Clare Crowther. Clare gave her "Listen ... to Solve" speech at Humberside's Rotary meeting at Willerby Manor on 15 November. In his vote of thanks, Martyn Kirby said it was one of the most professional speeches he had heard in all his years at Rotary. The UK and Ireland Conference featured Clare Crowther giving her Award winning speech, followed by a workshop to show how you too can become a Toastmasters International Accredited Speaker. Clare Crowther was honoured to speak on "Unconscious Bias" at the first national Safeguarding Academy Conference yesterday. The other speakers, and the illuminating play from Footlights, resulted in a day which was extremely well-received by the delegates. Well done to Kate Young for initiating this new annual event. Look forward to the Safeguarding Academy Conference 2018! Clare Crowther is the 70th Toastmasters International Accredited Speaker worldwide, and the first in the UK. The Award was gained after Clare gave her final speech, "Listen ... to Solve", at the 86th International Convention in Vancouver, Canada on 26 August 2017. Clare Crowther was honoured to receive an "Outstanding Contribution Award" at today's Employer Led Programme celebration at South Hunsley School 6th Form. 28 Teams competed in the South Hunsley Year 10 team product development challenge today. The panel of 5 judges had a difficult decision choosing a runner up and winner. Clare Crowther of Your New Horizon is pictured here announcing the winners. The winning product was an original game which teaches children the hazards of smoking. Well done to all 28 teams for the hard work producing the products and the courage to stand in front of 165 people presenting the product, market, price, research, and USP. Clare Crowther was delighted to be a speaker at the Yorkshire Accord Annual Event today with her speech "If I Were You ..."
The multi-organisation audience were a joy to work with. Well done to Karen Hickman for organising such a smooth-running event. Great day at Buy Yorkshire in Leeds today! Met journalist Alastair Campbell, Olympians Derek Redmond and Craig Heap and "manned" the Toastmasters International stall. Looking forward to meeting with other interesting people during Humber Business Week 5-9 June 2017. Last night's first performance of "Flood Part 2 Abundance" proved a hit with the audience, and more than a little damp for the performers. Your New Horizon's Clare Crowther is proud to be part of "Flood" - the ambitious year long multi-media story in Hull's year as UK City of Culture. Delegates at today's CV, Application and Interview Workshop gave appreciative feedback. Providing steps for the next career move gives a place to start the journey. This evening at Hull Speakers, Clare Crowther won the Club's International Speech Contest. A fantastic audience for the first of two Unconscious Bias Workshops at the WOW festival in Hull today. Still chance to catch a repeat of the workshop at 1:30 pm tomorrow. Thank you to all the Business and Arts attendees at the "Listen & Learn!" event yesterday. A great audience made for an interesting, enjoyable and entertaining day! Members of BLOK - Business Ladies of Knaresborough - and their guests, welcomed Clare Crowther yesterday evening to Henshaw's. Clare gave a speech, and then ran a workshop on, "Unconscious Bias". Audience members said that the evening was informative and thought-provoking. Clare Crowther has been awarded "Advanced Communicator Silver" by Toastmasters International. Clare is seen here receiving her award from Distinguished Toastmaster Michael J Clarke. Clare will be co-presenting, with Jan Antons ACS, "Listen & Learn" on Saturday 14 January 17 at the Holiday Inn Express, Hull from 09:45 until 3 pm. An exciting day at the Launch of UK City of Culture Season 1. 7 a.m. meet at Paragon Station for the the live National TV broadcast of the special arrangement of "Caravan of Love"
Privileged to perform at the press event at Hull Truck, and watch the livestream event as it unfolded. 2017 is going to be amazing for the city of Hull! Clare Crowther was delighted to be voted winner of the Humorous Speech Contest in Hull yesterday evening. Two months of training culminated in Clare Crowther, as Community Correspondent, visiting the Freedom Festival for all three days. A phenomenal variety of arts and culture entertained family and friends throughout the weekend. All bodes well for UK City of Culture next year. Clare Crowther was a Dragon for South Hunsley Year 10 projects. Choosing the winners was challenging because the projects showed a mixture of imagination, consideration and cooperation. Most of the teams' presenters were doing so for the first time in front of such a large audience. All did themselves proud. Clare had the privilege of ending the session by giving commendations as well as the Runner Up and Winner prizes. Clare Crowther enthusiastically embraced the role of TeenTech Ambassador at the KCom Stadium today! 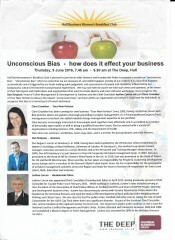 Dan Simpson, Siemens; Justine Curran, Humberside Police; Clare Crowther, Your New Horizon were the Speakers at the "Unconscious Bias" Event at the Deep for Humber Business Week. 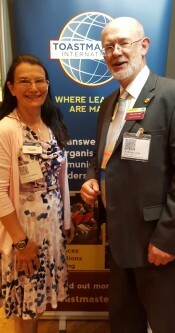 Toastmasters International was represented at the BUY YORKSHIRE 2016 conference by Toastmasters from across the region – Leeds, Doncaster, Hull, etc. Clare Crowther, from Hull Speakers, is pictured here with Distinguished Toastmaster, Anthony Day. The East Yorkshire Branch of the FSB (Federation of Small Businesses) held its inaugural Business Opportunity 2016 event at the recently opened Society cocktail bar in Beverley yesterday evening. 48 Business Owners attended on “Groundhog Day”. The event proved to be nothing like a repeat of other network meetings! Productive pre-booked one to one meetings followed. Society's Owner, Dave Molloy, offered tours of the Society building and shared his exciting Vision for its future. Clare Crowther was thrilled to be voted winner of the Humorous Speech Contest in Hull yesterday evening. The audience was boosted by a number of visitors who, is it hoped, will return to experience a "normal" meeting. Clare Crowther was proud to be a Dragon for two days. The Dragons judged 60 innovative sales pitches. The event was organised and led by Mrs Barley, Subject Leader-Extended Studies, from South Hunsley's Sixth Form College. Each team designed a children's toy, built a prototype, calculated costings and price, prepared advertising materials and, finally, presented a Sales Pitch to a panel of "friendly" Dragons. Ideas ranged from rattles to parachutes; from cars to paddling pools. All in all a great display of team-working and imagination. It was a pleasure to play a part in the event. Clare wins International Speech Contest. Clare Crowther won the Area International Speech Contest for Toastmasters International in Leeds this month. Clare gave a speech entitled "The Stage" which explored the lessons public speakers can learn from the acting profession and vice-versa. Congratulations to Sarah Dawkins, Runner Up in the Nationwide competition to find the nation’s best self-employed professionals. Sarah received congratulations from David Cameron at No 10 Downing Street. Clare Crowther of Your New Horizon is privileged to have mentored Sarah. Sarah says "Clare built my confidence around my business. I was very unsure in the beginning and needed her to push me out of my comfort zone." As a member of Alumni, Clare Crowther was proud to see how great the University of Hull looked on Saturday! Visitors to our Alumni stand gave glowing reports of their day. Bodes well for our region. Wow! Hull's 30th Heritage Open Days. Your New Horizon was pleased to sponsor Heritage Open Days 2014. This year marks the 20th anniversary of the national Heritage Open Days (Hull have been doing this for 30 years). 2014 is also the 50th anniversary of Hull Civic Society. With the Freedom Festival the previous weekend, what a great place to be! Achieve Your Goal full house. "Full house" for Clare Crowther's Achieve Your Goal workshop. Energetic and enthusiastic audience participation continued into the break! more recently, working with SME business owners on their Strategic Planning and People Motivation. The benefits, and logical key steps needed to Achieve Your Goal! There was an overall vibrancy to this well attended, first Growth Conference run by LYNYCC at the Crown Spa in Scarborough. Thanks to Kath Turner for the photograph. The local connection with the oldest golf clubs was one of the interesting points presented at of the 2013 Hull Heritage Open Days (HODs) Launch - see below. As one of the sponsors, Your New Horizon was proud to attend this event. The Guest of Honour, Lord Haskins of Skidby, gave an inspiring speech on the importance of heritage. Dr Mike Hird, of Hull University, amazed us with his chemistry knowledge as the University celebrates 40 years of Liquid Crystals. We also heard from John Netherwood, Chairman of Hull Civic Society, about their next project - Maister House - improving signage and lighting at the grade one listed building. The Society also hopes to finance the purchase and display of a replica set of golf clubs to help tell the story of the discovery of eight ancient clubs in a boarded-up recess in 1898, which are believed to be the oldest in existence. Your New Horizon sponsors One Hull of a Boat. Your New Horizon is pleased to announce its registration to provide business consultancy to the Green Port Growth Programme. Business Support and Advice is aimed at supporting businesses within Hull and the East Riding of Yorkshire. The support will help local businesses to recognise and embrace potential opportunities within the renewables sector. Congratulations to Sarah Dawkins Health Consultancy who yesterday won "2013 Company to Watch" at the Graduate Entrepreneurship Awards. Clare Crowther of Your New Horizon is privileged to mentor Sarah. UAD plans to increase capacity in line with increased demand for its specialist Automation, Design, Development and Precision Engineering services. The team are taking a considered approach to expansion thus ensuring that they maintain their reputation for a highly skilled and adaptable service (see www.uadengineering.co.uk ). Mentoring on specific Leadership & Management skills. Clare Crowther was a speaker at the National Conference of the Association of Hearing Healthcare Professionals (AIHHP). Her speech "What Would Most Benefit Your Business?" was welcomed as interesting, thought-provoking and relevant. Your New Horizon sponsors Heritage Open Days. Your New Horizon was pleased to sponsor Heritage Open Days 2012. With the Freedom Festival and great weather - what a weekend! We are now offering Enterprise Mentoring through the Get Mentoring scheme. Clare Crowther, MIOEE (Member of the Institute of Enterprise and Entrepreneurs), is a qualified Enterprise Mentor. Graduate Entrepreneurship pitching session extremely well received. 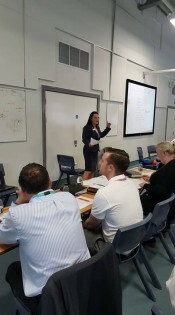 Clare Crowther's "What Makes a Successful Pitch" session was extremely well received by the delegates at last week's Graduate Entrepreneurship Boot Camp in Barnsley. The entrepreneurs' pitches presented to the panel the following day went really well, and they all appeared to learn a lot from the process. "I am a registered and approved Growth Coach for GrowthAccelerator helping ambitious businesses achieve rapid and sustainable growth by providing tailored expert advice. 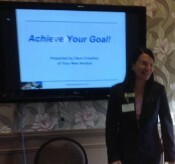 Find out more at www.growthaccelerator.com"
Clare ran her "Achieve Your Goal" workshop in Scarborough for Enterprise Yorkshire's "Road to Future Business" Event. As well as a new technique, the participants gained a broader network of contacts through enthusiastic interaction! "Don't Do As You Would Be Done By" well received. Clare's "Don't Do As You Would Be Done By" workshop was well received in the Edge Conference Centre located in Sheffield University Friday 11 May 2012. Understand elements of motivation, preferences and behavioural theories. A winning formula that could change lives! Briefing completed. Clare Crowther is now able to provide Business Coaching for Growth for qualifiying clients. Contact Clare direct for more details. Congratulations to Dr Lee Karen Stow on her Honorary Degree awarded by the University of Hull. Your New Horizon is proud to have coached Lee on the delivery of her acceptance address. Lee was told it was one of the finest speeches heard at the University since the address given by Archbishop Desmond Tutu. Lee says "I would recommend anyone facing such a daunting task to call Clare". Clare is writing a series of Change Management articles starting with an introductory piece in February. Want to know how to make business change successful? Curious about the human factor involved in change? Read on ...a series of articles over the next few months will explore the diverse elements needed. Your New Horizon sponsors Young Enterprise event. Last Friday saw Your New Horizon join other sponsors for A Grand Celebration in the spectacular surroundings of the Guildhall. The event raised £3100 for Young Enterprise. Following on from the success in York, Clare has agreed to run her "Don't Do As You Would Be Done By" workshop for Women's Enterprise in the Humber next year. Venue is likely to be in the Hull area. Date to be advised. Clare ran her Don't "Do as you would be done by" workshop as part of Positive Women's Day in York on 29 November 2011. Did your mother, like mine, tell you to "do as you would be done by"? This sage advice is given with the best of intentions. However, if you want to succeed in business, and in life, then the ability to motivate others (as well as ourselves!) is vital. A winning formula that could change your life!